Up close it’s enormous, if you stand beside it the top of your head is in line with the top of its feet. Weighing in at over 200 tonne’s the Angel takes the form of a human figure. At 20 metres high, the Angel is higher than a five-storey building. Its wings are 54 metres wide – about the same as a jumbo jet! Overlooking the A1 at Gateshead, at least 90,000 motorists a day pass by the sculpture. 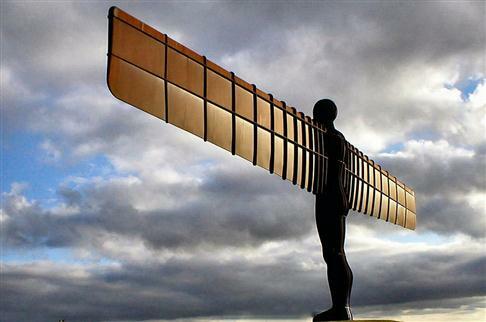 Rail passengers travelling on the East Coast mainline from London to Edinburgh also see the angel as they approach Newcastle. The sculpture is made from weather resistant steel, containing copper, which forms a patina on the surface that mellows with age, it required 150 tonnes of concrete dug 22 metres deep to secure it from high winds.